Built in 1991, our home is bright, inviting and the perfect place for a wonderful vacation with family and friends in tropical paradise. Located on a peaceful, friendly side street, you're only a few short steps away from quiet beachfront access - or lounge in the sun and enjoy a swim in your own private pool that is within a two- story screened enclosure. It is the perfect place for relaxing and entertaining. Enjoy morning coffee on the large screened lanai and watch the amazing colors of a Southwest Florida sunrise. 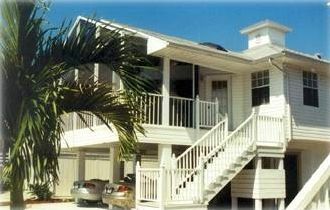 Each of the three bedrooms features a deck with sliding glass doors to enjoy wonderful gulf breezes. The master bedroom has a king-sized bed with a private bath and walk-in closet. The second bedroom features a queen bed, and there are two twins in the third bedroom (which can be joined together for a king-sized bed), both sharing a main bath off the hallway. The kitchen, dining room, and living room are an open area with vaulted ceilings, and two large, windowed walls open to a huge screened lanai with a view of the gulf. Our home is very modern and nicely furnished with a fully equipped, gourmet kitchen. The kitchen features all new stainless steel appliances, and the dining room has seating for six. A Publix grocery store is only a short walk 2 blocks away! Cook a gourmet dinner, or enjoy a walk or short drive to many of the fine restaurants on the island. Bath towels, beach towels, and linens are provided, and there is a washer and dryer for your convenience. Enjoy hours of beachcombing for unique shells and sand dollars. Take an early morning walk on the beach to witness the antics of the pelicans and dolphins. There is cable TV and a VCR in each bedroom, and a big-screen TV with DVD and VCR to entertain you in the living room- but don't miss out on the magnificent sunsets and nightlife that the beach has to offer! We hope you enjoy your stay in our home. We have designed it to be comfortable and affordable. Thank you for not smoking in our home and for not bringing your pets with you. Relax and have fun! We hope you'll return again on your next vacation. We loved the house and pool, it was very comfortable and had lots of extras to enhance our stay. The beach was at the end of the road and we walked with all the equipment in the garage. Public on next block was handy too. We enjoyed fantastic food at Edelweiss Burgers, Mantanzas and Nervous Nellies and loved watching sunset on the pier. The roadworks on the main road were annoying but couldn’t be helped and didn’t affect our stay. We would happily return. Enjoyed! Very nice, clean, comfortable home. We had 3 adults, 2 children. Great location. Walkable to beach! Hope to visit again next year. The information stated in the presentation of the house stated that you would be a few steps from beach access. It needed to state that the house was located across the street and at least a block away to access the beach. This is imperative information if you have a handicapped person who can't walk this far to the beach or view the beach from the house. The dryer doesn't work that well. Otherwise, the house was very clean and a quiet neighborhood. Perfect for a quite getaway if you don't want beachfront or beach view. I would recommend it for cleanliness, price, and quietness. Sorry you were disappointed with our location. In the 15 years we’ve hosted guests proximity to the beach has NEVER been an issue, and in fact is raved about. We never represented that we are beachfront, and 100 or so yards is not a far distance. Guests who have mobility or other concerns about access to our elevated home always ask specifics beforehand. Additionally, our address is provided upon payment of the deposit, thus a quick search of our home’s exact location would have shown exactly where we are situated. Perhaps more due diligence on guests part would have eliminated any issue. Not sure what your issue with our dryer is as we were there days prior to your arrival and easily washed and dried all linens, including comforters. This place is gorgeous than what the pictures show and its on a legit island.. Did i mentioned the pool! Close to great beach, screened pool, covered parking for two cars, close to grocery store. Beautiful home. Close to the beach. And pool. Glad you and your family enjoyed your stay at our Beachhouse. Thank you for being s great guest! We hope you’ll visit us again!